Oh, man. Wow. Wow, wow, wow. We’ve done it again! I can’t believe it! I mean, I can believe it. I saw it with my own eyes, and I can believe it, but it was absolutely awesome. This time last year, we were getting ready for a long offseason. 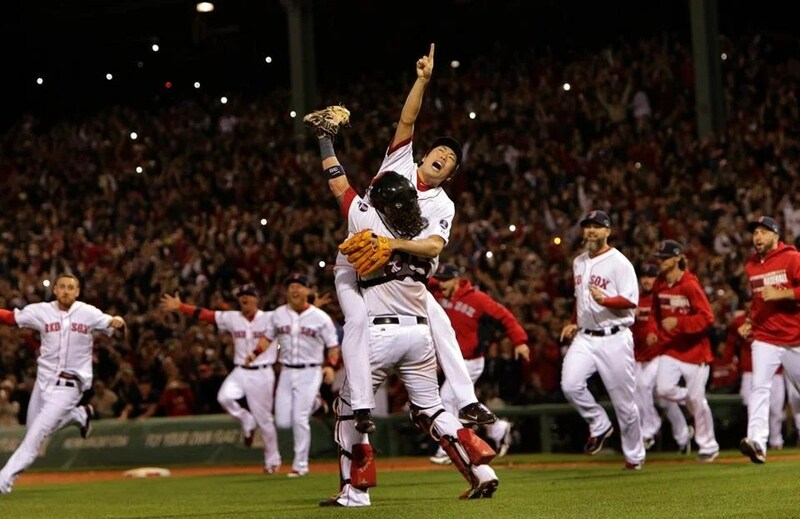 This time this year, ladies and gentlemen, we are going to the World Series! Detroit is officially taken care of, and we are moving on to the world championship. Oh, man. It’s so great to be back. And we’ll be playing the Cardinals. Rematch? Yes, please. This was yet another close one. We were the first to score. In the fifth. With two out, Bogaerts doubled and scored on a single by Ellsbury. Meanwhile, Buchholz wasn’t immaculate, but he was dominant. It was great. He maintained his command and control and just mowed right through. Until the sixth. He gave up a walk and a single, and then he was replaced by Morales. His final line read five innings and two runs on four hits with two walks and four strikeouts. Ordinarly, two runs would be a great result. But we needed something even better. Morales then gave up our lead. He issued another walk to load the bases with nobody out, and then he gave up a single that scored two. Workman couldn’t have come in at a better time; he induced a double play to end the inning. The fielding on that play, by the way, was textbook. Workman induced a flyout to lead off the seventh, but then he gave up two singles and loaded the bases when he made a fielding error. Then it was Tazawa’s turn; he ended the inning on a groundout. So the situation was really only stressful for the bottom of the sixth, when we didn’t score, and the top of the seventh, when we were waiting for another chance to score. And we got it. And we took advantage of it. Majorly. Gomes led it off with a double, Drew struck out, Bogaerts walked, Detroit made a pitching change, and Ellsbury reached on a force attempt thanks to a fielding error to load the bases. And once again, I have to say, I don’t know. I don’t know how it works. It must be the air here. I think it also had to do with the fact that we were back home. Being home does that too. And maybe also the fact that Bill Mueller threw out the first pitch. And it just happened. It’s like magic. It’s the magic of good baseball players playing good baseball. Or something. I don’t know. I really don’t. Victorino stepped up to the plate. He took a curveball for a strike and fouled off another one. And then he got another one. They were all the same pitch around the same speed. But that third one, he read like a book. Really. He powered up big time and sent that ball all the way out toward the Monster. Four runs on one swing. It was absolutely epic. Epic, epic, epic. With that grand slam, we got ourselves a three-run lead. Breslow pitched a one-two-three eighth, and Uehara owned the ninth as usual. Cue mob. Uehara basically summed it up. 5-2. Alright. It’s not over yet. We’ve still got plenty of work to do. I’ve been hungry, and I’m ready. I like being American League Champions, but I’m ready for the Cards and the World Series. Let’s go get it. Yet another close one. But I took issue with this one because it didn’t have to be so close. At one point, we had more than a one-run lead; it wasn’t much more, but in close games, every run counts. This particular contest happened to end well, but it was not exactly a high point for our pitching staff. We managed to just slide by, and now Detroit is facing elimination. We got on the board early, which I was obviously very happy to see. We scored three runs in the second. Napoli hit the inning’s fifth pitch for a huge home run; the count was 3-1, and he got a four-seam and read it like a book, sending the ball all the way out to center field. It was huge, and it started what was obviously a very important rally. Gomes then reached on a fielding error, and Bogaerts doubled after Drew struck out; both ended up scoring, Gomes on a double by Ross and Bogaerts on a single by Ellsbury. Then Napoli doubled in the third and scored on a wild pitch by Drew. Meanwhile, Lester did a great job. He had his share of baserunners, and he came close to squandering our lead. He gave up a run thanks to a single-single combination in the fifth. And another run thanks to a walk-single combination in the sixth. Actually he gave up a walk and a single en route to recording the inning’s first out, the RBI single itself was given up by Tazawa. And he gave up another run thanks to two singles and a double play in the seventh, which brought our lead down to one. That was when Breslow came on. He pitched through the first out of the eighth, and then Uehara took over. So Lester’s outing wasn’t one of those breezy starts. It was a grind. You could tell that it was a grind. Like I said, he had his share of baserunners, and he was really laboring through it. And he wasn’t exactly backed up by an airtight relief corps this time around. But we managed to hold on, so we reestablished our series lead after winning, 4-3. Oh, yes. Bitter medicine indeed. For Detroit. For us it was absolutely awesome. These have been some seriously close games, too close for comfort too often. But someone has to win, and it’s so awesome when it’s us. Especially when you’re basically beating your opposition at their own game (pun not intended). Lackey delivered a stellar performance. He pitched six and two-thirds innings of shutout ball; it’s hard to get much better than that. He gave up four hits and no walks, and he struck out eight. So yes, if he’d pitched the rest of the game without having given up those four hits, he would have had a perfect game. He gave up two singles in the first, a double in the fifth, and a single in the seventh. And that was it. The rest of his performance was blemish-free. He just mowed right through. But even though he didn’t last longer, our relief corps was just as solid. Breslow ended the seventh, and he, Tazawa, and Uehara teamed up for the eighth. Uehara went on to own the ninth, recording a four-out save. As I said, the games have been close, and this one was by no means an exception. Papi led off the second with a walk to become our first baserunner of the night. We didn’t have another one until Gomes singled in the fifth. Then Ellsbury singled in the sixth, and the game was won in the seventh with one out. Napoli went up to bat and took a four-seam for a strike. He took another four-seam for a ball and then two sliders for balls. Then Napoli got another four-seam. Big mistake. You can’t make mistakes with Napoli. You just can’t. It was Justin Verlander’s hundredth pitch, and Mike Napoli made Verlander pay. He powered way up and launched the ball out of the park out to left center field. It was huge. It was epic. And it was the only run that either team scored. The game was delayed due to a power outage in Detroit. I’ll bet the Tigers wished that would have extended to everyone else. Like Napoli. No power outage there. And that’s how we won by a final score of one-zip. What we did not need for Game Two was a repeat performance of Game One. What it looked like we were going to get was a Game Two performance even worse than our performance in Game One. But what we got was something completely unexpected in all of its familiar glory. We were no-hit through six innings. And if Victorino hadn’t gotten hit, and if Ellsbury and Papi hadn’t walked, we would have had no baserunners at all. 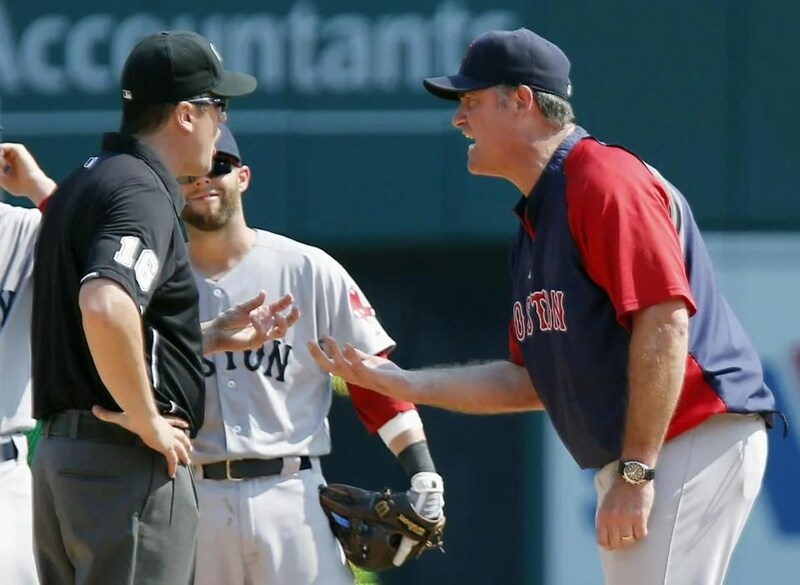 The same can not be said of the Tigers, who were busy capitalizing on Buchholz’s mistakes. Admittedly, there weren’t that many. But when your offense is completely turned off, one run against you can feel like ten. Buchholz went one-two-three in the first. After striking out his first batter of the second, he gave up a single, a double, and an RBI single. He went one-two-three in the third and contended with two baserunners in the fourth after he recorded the first two outs and then hit a batter, issued a wild pitch, and dealt with Drew’s fielding error. Then he went one-two-three in the fifth and gave up more runs in the sixth. He gave up a solo shot with one out, and then he gave up another run thanks to two consecutive doubles, and then after securing the inning’s second out he gave up a two-run home run. Plenty of mistakes. He gave up a single after that and was replaced by Workman, who issued a walk and induced a groundout. Two outs into the seventh, Doubront came in and ended it and pitched a fine eighth. Fortunately, we finally got on the board in the seventh when Victorino singled and scored on a double by Pedroia with two out. So we broke both the no-hitter and the shutout bid. But we didn’t follow that with a rally. Instead, we went down in order in the seventh. Drew opened the eighth with a groundout, and then Middlebrooks doubled, Ellsbury walked, Victorino struck out, and we were all bracing ourselves for some very unpleasant flashbacks. Then Pedroia singled to load the bases, and then I don’t know. I really don’t know. I don’t know what it is. It could be everything aligning perfectly at exactly the right moment. It could be the ideal combination of a number of factors. Or it could simply just be something in the air. It’s just really hard to figure out. But somehow we just have this thing. I can’t explain it. It’s just a thing that we do that happens at a certain time of year. And I guess there are just some people who can tap into that, and then things just happen and it’s perfect. So when David Ortiz stepped up to the plate, I started bracing myself for flashbacks of a different sort. I didn’t even have time to feel it in the air. It just happened. It happened faster than any of us could recall the same kind of thing having happened in the past. It was just David Ortiz at home, standing at the plate, connecting with the ball. Simple. Just like that. And he worked the magic. It was an eighty-six mile-per-hour changeup. It was the first pitch thrown by Detroit’s latest reliever. And it ended up beyond the right field fence into the bullpen. With one swing of the bat all the way in the eighth inning, David Ortiz tied the game and paved the way for us to tie the series. David Ortiz hit a grand slam. And then Uehara pitched the ninth. And then Gomes singled, moved to third on a wild pitch, and scored on a single by Salty. It was a walkoff. Just like old times. We won, 6-5. In other news, the Pats eked out a win against the Saints, 30-27. That was not exactly the series start that I had in mind. Not even remotely. That was one of the closest games I’ve ever seen in October. Uncomfortably close. And, because we lost, crushingly close. Seriously. Our offense was completely silenced to an embarrassing, unacceptable, and baffling degree. Lester delivered a great start. Really, our whole pitching staff pulled it together and delivered the best start they could deliver under these conditions, namely, no run support whatsoever. Lester pitched six and one-third innings and gave up six hits, one walk, and one run. He struck out four. He faced the minimum in the second, third, fourth, and fifth innings. He gave up two singles in the first and his one run in the sixth. He induced a groundout to start it off and then issued a walk, hit a batter, recorded a force out, and then gave up an RBI single. The runner had been able to move to third on the force out, so at least we got an out out of it. I always say that if you have to give up a run, you may as well try your best to get something out of the situation as well. He was lifted after he induced a lineout and hit a batter in the seventh. Tazawa pitched the last two outs of the seventh, Breslow pitched the eighth, and Uehara pitched the ninth. Meanwhile, and this is the really painful part, not only were we completely shut out, but we were also almost no-hit. That’s right. We managed only one hit all night. That hit belonged to Nava. We had two on in the first thanks to a wild pitch and a walk. We walked twice in the second. We went down in order in the third, fourth, and fifth. We walked three times in the sixth and had the bases loaded with two out. We went down in order in the seventh and eighth. 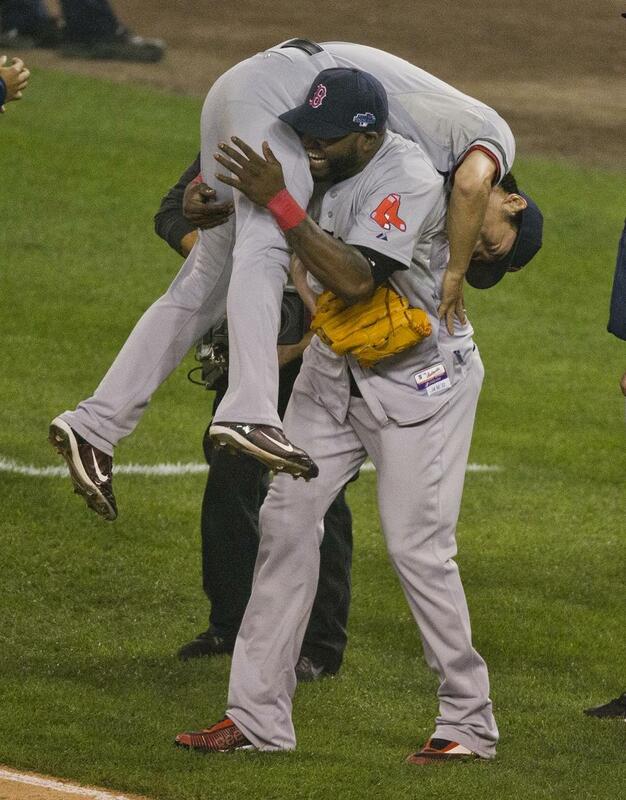 And Nava broke up the no-hitter in the ninth when he singled with one out. If Bogaerts had come up with the right type of hit after that, we could have walked away winners. All he managed was a popout on a full count. Needless to say, when Nava recorded that hit, I was immensely relieved. It’s bad enough to lose. It’s worse to lose in the playoffs and even worse to lose the first game of the ALCS, especially if it’s at home, which is your prime opportunity to get wins in. And it’s worse to provide no run support whatsoever, although we can at least feel good about the fact that our pitchers did a ridiculously awesome job of keeping us in the game the whole time. I mean, it’s not easy to hold the opposition to only one run for an entire game. Then again, it’s even harder to hold the opposition to no runs for an entire game, which is what Detroit managed to accomplish. But let the record show that we were not no-hit. No, we most definitely were not. We didn’t get our hit until the ninth inning, but we got it in the end. This was the first time a postseason no-hitter was destroyed in the ninth inning since 1947 when the Brooklyn Dodgers did it against the Yanks. Unlike us, however, the Dodgers ended up winning that game. Anyway, between the fact that we thwarted their bid and the fact that we ourselves held them to only one run, we can retain our dignity with our heads held high. It should also be noted that it wasn’t just one pitcher working against us; the Tigers trotted out a good number. We did walk six times. But we went 0 for 6 with runners in scoring position and left eight on base. With a final score like 1-0, it could have been anyone’s game. Unfortunately, Lester happened to crack first. It’s obviously true that it could have been possible for him not to crack first or not to crack at all. But it’s hard to do much better than that. This was an epic week. It was an epic, epic week. Last Saturday, we bested the Other Sox in a big way. Peavy pitched seven innings and gave up only two runs on five hits while walking one and striking out four; Breslow pitched the eighth, and Britton pitched the ninth. Those two runs were the result of a single-force out combination in the third and a single-single combination in the fourth. But we scored more. In the first, Ellsbury singled and scored on a single by Napoli. Napoli and Gomes hit back-to-back doubles in the third. And two singles, a double, two groundouts, and another single yielded another three runs in the fourth. Gomes singled and scored on a single by Bogaerts in the fifth. Two singles and a walk loaded the bases in the sixth, and a wild pitch brought in the game’s last run for a final score of 7-2. We managed to walk away with a win last Sunday as well. Doubront gave up four runs on seven hits in less than four innings of work, and the rest of the game was pitched by Workman, who got the win, as well as Morales, Tazawa, Breslow, and Uehara, who got the save. Workman and Breslow each allowed one run of their own, but fortunately, yet again we scored more. Carp singled, Salty walked, and both scored on a single by Ellsbury in the second; Victorino and Pedroia both walked, and Ellsbury and Victorino scored on a double by Papi. Drew hit a solo shot in the third. And Ellsbury walked and scored on a single by Pedroia in the fourth with a little help from a throwing error. We began our series with Detroit on Monday with a loss, which was unfortunate because Lackey pitched really well, giving up only three runs in over seven innings of work. We lost because we got shut out. Again. It was just one of those days where good pitching happened to coincide with bad, or in this case nonexistent, hitting. Tuesday’s game went a lot better; good pitching coincided with good pitching, and a lack of hitting coincided with a lack of hitting, but we did that much better to pull it off. Specifically, we did one run better, winning by a final score of 2-1. The game was literally won in the fifth inning, when Gomes singled, Drew doubled, and both scored on a single by Middlebrooks. Lester gave up only one run in seven innings, and the relief corps, featuring appearances by four pitchers, held it together. But I have to say that the highlight of this past week was unquestionably our epic victory over the Tigers on Wednesday, during which we scored a whopping twenty runs. That’s right. We won by a score of 20-4. Let me repeat that. We won by a score of 20-4. Wow. With that run total alone, we could have won every game for at least a week. Dempster started that one and gave up those four runs in his six innings; Workman, Morales, and De La Rosa each pitched an inning after that. But that offensive performance was supremely epic. Epic, epic, epic. The only member of the starting lineup not to have gotten at least one hit was Pedroia, and even he managed to bat in a run. We put twenty-five base runners on the field that day, and only five did not step on home plate. The only inning in which we didn’t score was the first. In the second, Nava singled and Drew homered. In the third, Ellsbury homered. Papi led off the fourth with a homer. Victorino singled and scored on Pedroia’s sac fly in the fifth. And then came the sixth, which was one of the biggest and most massive innings I have ever seen. We scored eight runs in the sixth inning alone; that’s more than we’ve scored in some games and even over the course of several games combined. It was absolutely amazing. First, Nava walked, Napoli doubled, and Drew walked intentionally to load the bases with nobody out. Then Carp came in to pinch-hit and ended up walking, which scored a run. Then Detroit made a pitching change, and Middlebrooks proceeded to welcome the new pitcher to the game by going hard on the second pitch of the at-bat for a grand slam. Yeah. A grand slam. Like I said, it was epic. Then Ellsbury struck out, Victorino got hit, Pedroia struck out, Papi doubled in another run, and Nava’s homer accounted for another two. Like I said, it was epic. We followed our eight-run sixth with a five-run seventh. Drew doubled, and then Middlebrooks was awarded the home run that he deserved after a review. Then Middlebrooks doubled and scored on a single by Quintin Berry, who came in to pinch-run for Victorino in the previous inning. And then Papi homered for another two runs. And then Napoli led off the eighth with a homer. Those eight home runs in a single game, a feat previously achieved in 1977, tied a club record. It was the first time any team had done it since 2010. (Interestingly, we played the Blue Jays in that ’77 game, and it was the Blue Jays who did it in 2010.) It was also a banner day for Papi, who collected his two thousandth hit in the process and who deserved every second of the standing ovation that he received. He also passed Billy Williams for forty-seventh on the all-time homer list. We carried that offensive momentum with us right into our next win. We started our series with the Evil Empire on Thursday, and the final score was 9-8. Peavy gave up four runs in six innings, Thornton gave up another two, and Tazawa blew his save by giving up another two. Then Breslow was awarded the win, and Uehara was awarded the save. We needed ten innings to get it done, but the fact that we got it done was the greatest part. Lavarnway and Middlebrooks led off the third with a pair of singles, and Lavarnway scored on a double by Ellsbury while Middlebrooks scored on a groundout by Victorino. Middlebrooks homered in the fourth. Victorino led off the fifth with a homer; then, Pedroia, Papi, and Nava loaded the bases with nobody out with two singles and a walk. Pedroia scored on a single by Napoli, and Papi scored on a force out by Lavarnway. Nava doubled and scored on a single by Lavarnway in the seventh. The bottom of the seventh was an enormous mess, during which the blown save occurred; fortunately, with two out in the ninth, Napoli singled and scored on a single by Drew. With one out in the tenth, Ellsbury singled, stole second, and scored the winning run on a single by Victorino. The same good things can be said about Friday’s game, which, thanks in large part to the Yankees’ bullpen, we won, 9-8. Doubront himself actually gave up six runs on six walks and three hits, one of which was a home run. But our bullpen held it together. Meanwhile, Napoli led off the second with a single and scored on a single by David Ross. Napoli led off the fourth with a double and scored on a groundout by Drew. Middlebrooks led off the fifth with a solo shot. And then we scored another five runs in the seventh inning alone, during which the Yanks went through three pitching changes. Ross singled, Middlebrooks flied out, Victorino singled, and Carp walked to load the bases. Pedroia singled in Ross, which kept the bases loaded, and after Papi struck out, Napoli worked the count full after receiving seven pitches but went yard in a huge way on the eighth pitch, delivering an enormously massive grand slam. I can’t even describe the awesomeness of it all. And we weren’t even done. With one out in the eighth, Middlebrooks singled and then Victorino homered them both in. Carp singled, Pedroia grounded out, and Papi and Napoli each walked. Nava walked in one run, and Drew singled in another. Yesterday, we enjoyed yet another high scoring performance, winning 13-9. Lackey lasted less than six innings and gave up seven runs on eight hits, and then Britton, one of four relievers that we had to sent out, allowed two runs of his own. But, in keeping with the week’s theme, we scored more. Papi led off the second with a double, and Napoli followed with a home run. Bogaerts led off the third with a double, Victorino got hit, and then it was Gomes who homered. We had four straight scoring plays in the fourth, after Middlebrooks and Bradley led it off with two singles: Lavarnway doubled, Bogaerts grounded out, Victorino doubled, and Gomes singled. And then Pedroia doubled and Papi hit a sac fly. Each of those scoring plays accounted for one run. Bradley walked in the fifth, and one out later, Bogaerts hit a two-run shot. And then Napoli homered in the ninth. We played very well yesterday also, but it wasn’t good enough. This one was evenly matched, but the wrong team came out on top. Lester turned in a quality start, giving up only three runs over the course of eight innings. But they just scored one more run than we did. Papi and Carp led off the second with back-to-back doubles that accounted for our first run, and Papi doubled and scored on Salty’s groundout in the sixth. 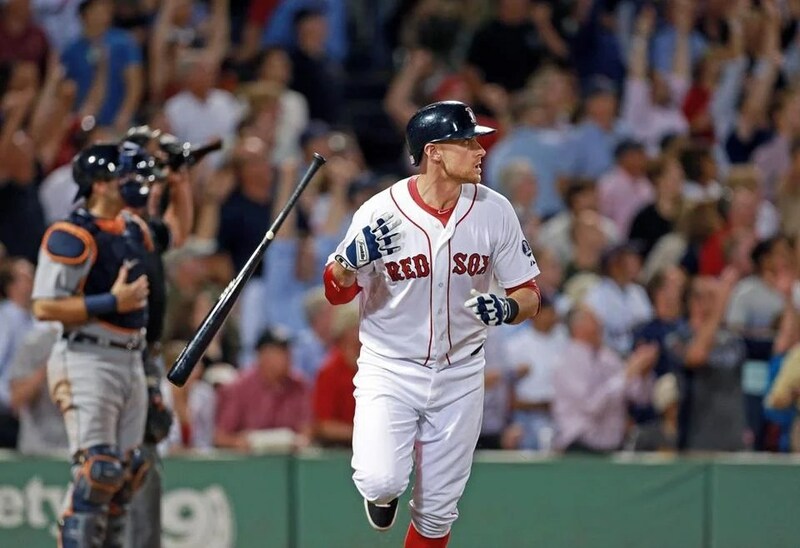 And then Middlebrooks delivered in a big way, smacking a game-tying solo shot to lead off the ninth. But Workman’s not-so-excellent work in the bottom of the inning did us in. He looked great at first, but between the first two outs of the frame, he allowed a single, which became important when he issued a wild pitch that brought the runner in. And so we lost, 4-3. And, as if our awesome performances were not awesome enough, we find ourselves in first place in the AL East, eight and a half games above Tampa Bay. (The Yankees, might I add, are eleven games out of first, which is good for fourth in our division, and at this moment, they are not even in the running for the Wild Card.) We also have the best winning percentage in the entire Major Leagues. And that’s a great place to be. In other news, the Patriots played the first regular-season game of the year yesterday! We beat the Bills, 23-21, in a real nailbiter that went right down to the wire. We went 3-1 in preseason, beating the Eagles, 31-22, and then the Buccaneers, 25-21, and after losing to the Lions, 40-9, which was especially scathing, we beat the Giants, 28-20. This was one of those games that ended in an infuriating way because of an infuriating call. It happens sometimes. But technically, it shouldn’t happen at all. That’s the infuriating part. It’s completely avoidable, and yet somehow there is always some team that gets hurt. Honestly, I don’t really mind if that particular team happens to be an adversary of ours. But when it happens to you, you just know that there is no justice. We have seen better from Doubront, especially lately. But this really wasn’t that bad. He pitched five innings and gave up three runs, two earned, on four hits. He walked four and struck out two. Doubront led off his performance inauspiciously with two walks followed by an RBI double and an RBI groundout. He gave up two singles and a double in the second, and a run scored on a passed ball. He had a one-two-three third and a damage-free fourth and another one-two-three inning in the fifth. Through the fifth, we were in the lead by one, having scored four runs. Napoli led off the first with a single, Carp flied out, Drew walked, and Lavarnway singled in Napoli. Drew later scored on a sac fly by Ellsbury. That tied the game at two. Pedroia led off the third with a single and scored on a groundout by Napoli to retie the game at three. And we were winning after Lavarnway led off the fourth with a walk and scored on a groundout by Victorino. We didn’t score in the sixth, and Tazawa made sure that they didn’t either. We didn’t score in the seventh, but the same can not be said of the Tigers. Obviously. Because Bailey came out to pitch, and what has he done lately? He’s helped all of our opponents way more than he’s helped us, that’s for sure. Yesterday was no different. He gave up a single, secured the inning’s first out, gave up another single, and was then replaced by Miller. But Miller gave up a single to load the bases, and then recorded a strikeout. But then he did something really awful. Perhaps just as embarrassing as walking in a run is hitting in a run. By that I mean that Bailey hit a batter with the bases loaded, so he practically handed Detroit a free run. Admittedly, with the bases loaded, the damage could have done far worse, but that’s not the point. The point is that pitchers should have control that is far better than a lack of control that would allow a situation in which a hit batsman facilitates a run scoring. We didn’t score in the eighth. The Tigers led off the bottom of the eighth with what was obviously a fly ball. One up, one down. 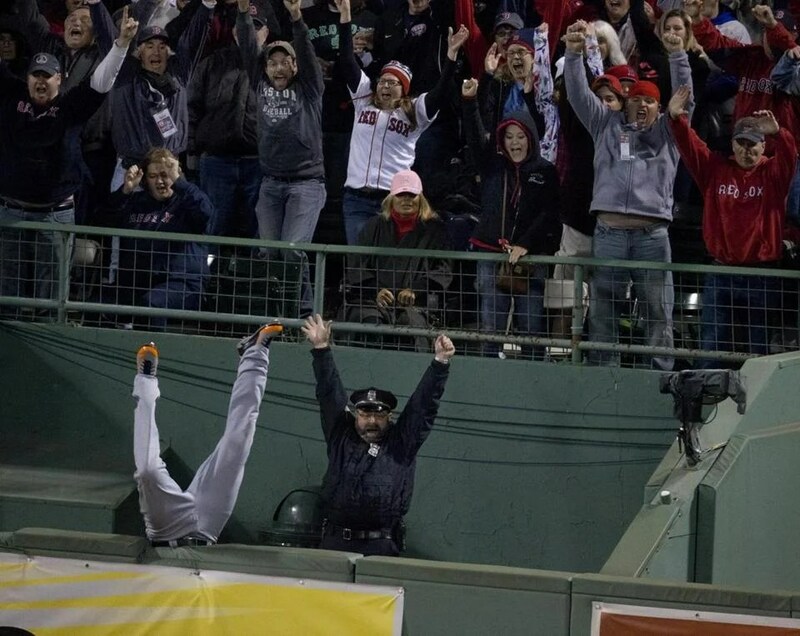 Nava caught it. And he put his hand in his glove to get the ball to throw it in. And then somehow second-base umpire Mike DiMuro made the absurdly ridiculous call that Nava had dropped the ball. John came out to argue and rightly so. He ended up getting ejected for the first time this year, but not before it was obvious to all that the ball was caught. That was an out. I don’t know which baseball game DiMuro was watching, but I’m pretty sure it wasn’t ours. To make matters even worse, Bailey made a throwing error, so what should have been the second out of the inning resulted in a situation with two men on base. Miller then loaded the bases again with a walk. He was pulled in favor of Wilson, who gave up a sac fly that brought in one run and an intentional walk. Breslow came on and gave up a two-run single. Pedroia led off the ninth with a single and scored on a double by Gomes, but by then the damage had already been done. And we lost, 7-5. If not for that completely botched eighth, it’s entirely possible and perhaps even probable that the game would have ended differently.